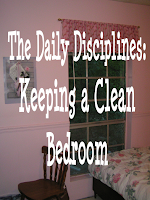 This week's daily discipline is that of keeping your room clean. Maybe you're already an expert at this, or maybe you sighed loudly when you read the title! In any case, keeping your own bedroom clean is an important daily discipline, for it's good training for when you have a house of your own. After all, if you can't keep one room clean now, how do you expect to keep a whole house clean? As always, let me assure you that I do not have a perfectly-kept room! I try to keep it clean and tidy, but it doesn't always stay that way. Usually, it's messy when I have a busy week and neglect to take the time to straighten it each day. These past few weeks have been hard, as I've had extra stuff for the musical in my room to sort and sew. With it over, however, I'm determined to once again work to keep a tidy room! When I do take the time to straighten up each day, I find that the atmosphere is so much more cheerful and inviting! It's a lot easier to find things, and takes less time overall when I don't have to search for things I need. I try to follow the old adage, "a place for everything and everything in its place." If you haven't kept up with the clutter, it will take some work to get your room to a place of being easily straightened each day. You'll want to spend some time and go through and organize everything, if possible. In fact, that's what I'll be doing this week, as I sort through things to figure out what I can get rid of and what I need to buy for college. When you know what you have, it's much easier to find a place for everything, and when everything has a place, it's much easier to quickly put things away. When organizing, it helps to turn on something to listen to as you work - uplifting worship music, soothing classical music, or a thought-provoking message will help you work hard and cheerfully. Either spend an entire day devoted to organizing, or do things in little bits. Pick an area and work on sorting everything, having a trash can handy for things that need to be thrown away, and having piles for things to give away, put away in another part of the house, or put away in another part of the room. Once finished in one area, move on to another, and once done sorting and organizing, make sure you deal with the piles you've made and take out the trash. There are many and various ways to organize, which would take too long to go over. One big thing that has helped me (thanks to my sister Miriam's suggestion!) is to use plastic containers with covers to store and stack things under the bed or in the closet. It's amazing how much you can keep in a small area when you keep things in containers! Once your room is in order, spend some time each day to make sure that it stays that way! A little work done each day (often in less then 5 minutes) will go a long way to ensure a well-kept room. Try to include straightening up in your morning or evening routine. Some people find that straightening their room before bed works well for them, while I prefer to do it in the morning as I start the day. Whenever you do it, work to quickly put things in their place, making your bed, and putting away clothes and shoes, and anything else that may have gotten left out. Of course, if you put things away as soon as you take them out, it will be a lot easier to straighten up! I have a bad tendency to put clothes on my hope chest when I take them off instead of in the closet or clothes hamper. However, I'm trying to change that! Try to hang up, fold or put clothes in the laundry as soon as you take them off. When you get out of bed in the morning, try to immediately make the bed. When you come in after being gone, try to put things away instead of just dropping them in your room. Have a place to put your shoes as soon as you take them off and a place to hang your purse. Try to put things that you bring home away as soon as possible, and you won't have to spend precious time hunting for them when you need them! Even when you straighten every day, however, dirt still accumulates. Try to have one day a week where you not only straighten your room, but also shake rugs, sweep, dust, and do whatever else needs doing (such as changing sheets or washing windows). This will do a lot to make your room clean and inviting! If you share a bedroom, I know what it's like! I shared with one or more siblings until I was 14. It can be hard when you can't control the other person's stuff and they won't always clean up like you'd like them to, especially if they're younger. Try to work something out with them, however, working together or separately (whatever works best for you) to keep the room clean. Even if they don't clean up their part, still keep your things nice and tidy, and it's likely that they'll follow suit. If you get off schedule, don't despair! It may take a little longer to straighten things up, but try to do it as soon as possible, then continue straightening a little each day. I've found that the longer I put things off, the longer it takes to clean it up. Deal with the clutter as quickly as possible, and you may notice a wonderful change in your attitude for the better! Do you struggle with keeping your bedroom clean, or is it easy for you? What do you try to do to keep your room tidy? Is your room right at this moment messy or nice and straightened? Does it need to be organized? If so, consider spending time this week to sort and organize. I'll be doing it to my room, and it'd be great if you'd join me in doing your room! No but I sure struggle to get my oldest daughter to keep her room clean! She will clean it to near perfection and the next day it looks as if a tornado has hit. I have taught her to dust and vaccum herself - I just have to remind her to do it. I put laundry up as soon as it is dry and folded and make the bed every single morning unless my husband is still in it. LOL. I make sure to keep my husbands various pairs of shoes picked up and organized for him in the closet and I dust and clean mirrors twice a month. It is not messy right now. Does it need to be organized? I have a couple of drawers to organize but other than that it is pretty good. I found that it isn't hard to do if you just stick to a routine. Just put things up as soon as I'm finished with them so everything doesn't pile up. Thanks so much Anna!!! It's very hard for me to keep my room neat and surprisingly, it's my YOUNGER sister, Sarah, that's always reminding me to try to keep it neat!!! I mean, it's not horribly bad but my bed is usually the one that gets piled up. :( Thanks for the advice on it!!!! Its not that difficult, like you said clean up as you make the mess and it won't just pile up until you next clean it! Put clothes in closet, laundry hamper etc., make bed and tidy bedside table every morning. Is your room right at this moment messy or nice and straightened? Mostly clean except a few out of place things on my dresser. Does it need to be organized? My closet floor and dresser drawers could use some quick work, but not to bad. I really like these posts on cleaning our bedrooms, getting to bed on time, and getting up at a decent hour! Certainly 3 things that could use improving! It is unfortunatly very hard. I share a room with two of my younger sisters and my 3 year old brother who makes a bigger mess than he cleans up! Well, not a ton. We try to clean it really well about once a month or so. :-p I know. It is pretty much always messy. Do you LOVE to rearrange your room often? When I was younger and had my own room I would (literally) rearrange the furniture (not an easy task in a room smaller than most bathrooms!)weekly. I had it in EVERY possible configuration. And every IMPOSSIBLE configuration, too. I once had my bed ON TOP of my dresser. Seriously. Anyway, I love interior decorating and love clean rooms, but I just don't seem to be able to keep ours tidy. When I have the time to clean the room, someone's usually napping in it and I can't be loud. :-( Ah well. Thanks for this post-- I enjoied it very much! It is only moderately hard, though it has been hard recently because I am moving out in three weeks and have found little motivation all summer to clean, having that knowledge in the back of my mind. So right now, it is absolutely trashed and I HATE it. I love things to be orderly, and I can only tolerate disorganization for so long before I have to fix it. 1. Why is it necessary that a room not be messy? Really, what purpose does it serve? If it is not DIRTY (real dirt, old food, bad smells, etc. ), only MESSY (clutter, disorganized), and if it not a safety hazard, why is it important that an individual keep a clean room? I direct this question especially to mothers who often demand this of their children. If the child doesn't mind it, why does anyone else? 2. Is cleanliness really next to godliness? How? 3. Do you think that some women are so obsessed with tidying often because it is something placed on us by society or other women? That tidiness or neatness in a home can actually become a way for a woman whose house is spotless to "one-up" another woman if her house, for example, is quite messy? I've noticed many women are embarrassed by their messy houses... but... why?! Does it really have any bearing on their true character? * Do you struggle with keeping your bedroom clean, or is it easy for you? I used to struggle, and it's not super easy, but read below to figure out how I fixed the biggest problem! * What do you try to do to keep your room tidy? * Is your room right at this moment messy or nice and straightened? It's fairly tidy. As I work full time it can be hard at the end of the day to get up the energy to put away clothes and things, but on Saturday morning I always have a thorough straighten out. * Does it need to be organized? - Do you struggle with keeping your bedroom clean, or is it easy for you? - What do you try to do to keep your room tidy? Every night we put things in their places. And...if we don't expect quests, we don't usually use bedcover (we keep doors open to prevent echoing in livingroom). We try, but we both seem to forgot that chronically. - Is your room right at this moment messy or nice and straightened? Somewhat straightened. Bedcover is under the bed (I blame dogs) and carpet is in the corner (dogs again). - Does it need to be organized? My working table is in our bedroom - that is the only thing I'd change here. But it is not possible in this flat. - Why is it necessary that a room not be messy? - If the child doesn't mind it, why does anyone else? My house, my rules. When they move out, they can do whatever they want with their tidying. I am not so happy either with some household work but it is necessary. Some things just must be done. C'est la vie. - Do you think that some women are so obsessed with tidying often because it is something placed on us by society or other women? Nope. I think tidiness is in one's character. My uncle for example is more obsessed with cleaning than any women in our family :) And although my mother is strict with cleaning (she teaches that for living nowadays), we were not expected to keep our rooms clean. Nope, she didn't clean them either. She had a cunning plan and we started to clean them by ourselves when they started to be like pigsties. A clean room is more pleasant to live on. Alexis: I'll be learning how to live in an organized way when I start college this fall. I hope it goes well! Olivia: Sorry, I don't know what to do with that many shoes! When I shared with 1 brother and 2 sisters, we each had a plastic crate in which to keep our shoes, but that made them all jumbled together. One tip I learned from someone else is to keep them in their original box stacked in the bottom of your closet. It keeps them clean, but you probably wouldn't have enough room for all those shoes! 1. I do think it's necessary (for the most part) that a room not be messy. In my experiences, it makes my mood and the atmosphere so much better, it makes things stay in better repair, and it makes it quicker to find things, thus not wasting valuable time. It's also safer when you're not tripping over or stepping on things! 3. Yes, society and others make one feel more embarrassed of messy things, though I think even without them, one would be conscious of it. People shouldn't be so obsessed over having a perfect house that they forget to live, though. They should try to keep things tidy, but life happens, and enjoying family should come before having a perfectly clean house. Samalah: Yes, I've got a lot of trinkets and memories that I'll have to throw out or file away. They've come after 2 years of teaching dance and directing musicals involving lots of little girls! They're sweet, but do take up space. I just wanted to thank you for the encouragement, and say that I cant wait to get off work so I can go home and clean/organize my room! Otherwise, I usually keep my room rather clean. I find that clutter, especially when it is in my sister's half of our room is very distracting when I'm trying to study. However, I don't mind a little "cozy clutter", but that's usually means leaving something out for a day or two if I'm working on it. One thing that really helps me is that I tend to get rid of things I don't need. Is your room right at this moment messy or nice and straightened? messy as hell! I used to really struggle to keep my bedroom clean, but now that I know just how many dust mites there are living in that room, I don't mind spending the time it takes to clean it. It's so disgusting to know that literally thousands of bugs are crawling around our bedrooms!